BNO News “ the iPhone app that prides itself on bringing breaking news to you faster than any other news service, via push notifications “ has just had an update that continues to extend the range of push preferences available. One of the biggest features of this latest update is that if you subscribe to the service (which is an extra $0.99/month on top of the $1.99 purchase price of the app), you can now filter and set preferences for push notifications by categories and keywords. I think this is a very cool new feature “ allowing you to choose topic areas that you ‘d like to get notifications on, and even set keywords you want added to push. I ‘ve been using BNO News for just under a month now and find that it lives up to its ‘breaking news ‘ rep quite well. It always let me know about major, breaking stories well before AP Mobile, often having several bulletins out ahead of even an initial one from AP. I ‘m not sure yet whether I ‘ll go for the paid monthly subscription in order to add the category and keyword options over the long term, but I like the concept a lot and will certainly be giving it a try for a month or two once my initial free trial subscription runs out. ***** Just to be clear, you do not need to pay the monthly subscription to get the standard major breaking news headlines via push. 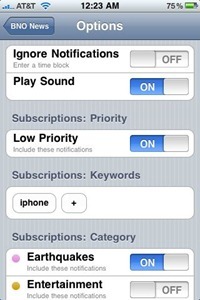 The subscription just adds the ability to receive lower priority notifications via the category and keyword selection methods. 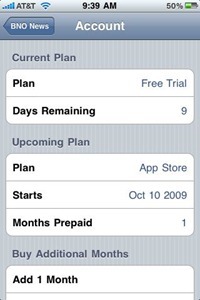 I also like that the in-app purchase options for the subscription service let you buy just one month at a time if you like (as well as 3 month and 6 month options). 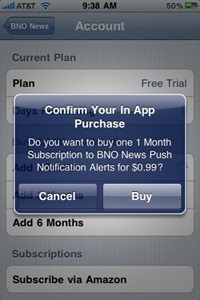 You can grab the latest version of BNO News in the App Store now, for $1.99. This is an app I have been wanting to buy…. I have heard from people that they will receive notifications numerous times regarding he same news story. I just don't want a million notifications regarding a story I don't care about or that happened hours ago. So Patrick what do you suggest? I am a news junkie & have been using the AP news app which is just not cutting it for breaking news stories. You do sometimes get several notifications on one story. But … they are not identical, they are fleshing out more details as they develop or similar generally. I've mentioned before that I'm not the world's biggest fan of push and I'm very edgy about getting too many alerts – and I can honestly say BNO News has never bothered me in this respect. Its level of alerts seems pitched just about right. YMMV of course. You did help…. I know you like BNO News & have recommended it in past articles. I was just a little put off by some of the reviews in the app store describing annoying push notifications every 2 seconds. It comes down to what you want…. I want a news app that is going to alert me of breaking news b/c every other app has failed at it. I am downloading this app now 🙂 Thanks Patrick. Cool – hope you like it. BNO is the one to get then. CNN & AP have nothing on them and are usually hours behind. If its the notifications you're worried about – then why not just follow them on twitter and check your twitter stream all the time? I just downloaded it about 3 secs ago & I just customized it…. I like the simple UI b/c news apps can get cluttered with junk when you really just need the essentials. Patrick are you trying to get me in trouble already, I don't get married until next Saturday…. LOL I will definitely have to create an alias. Thanks for the idea.